My meditation refers to the word "Evangelium" – "euangelisasthai" [Greek: "to preach the Gospel"] (cf. Lk 4:18). 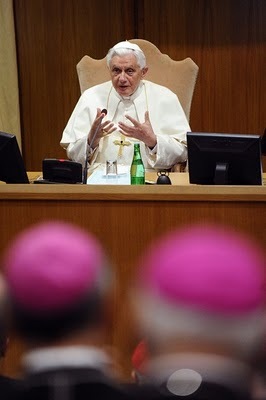 In this Synod we want to know more about what the Lord tells us and what we can or must do. My meditation is divided into two parts: a first reflection on the meaning of these words, and then I would like to try to interpret the hymn of the Terce "Nunc, Sancte, nobis Spiritus" [Come, Holy Ghost] on page 5 of the Book of Prayers. The word "Evangelium" – "euangelisasthai" – has a long history. It appears in Homer: it is the announcement of a victory, and therefore the announcement of a good, of joy and happiness. It appears, then, in the second part of Isaiah (cf. Is 40, 9), as a voice announces joy from God, a voice that makes it clear that God has not forgotten his people, that God, who apparently had almost withdrawn from history, is still there, is present. And God has power, God gives joy, he opens the doors of exile; after the long night of exile, his light appears and provides the possibility of returning to his people, he renews the story of good, the story of his love. In this context of evangelization, three words in particular appear: dikaiosyne, eirene, soteria - justice, peace and salvation. Jesus himself took up the words of Isaiah in Nazareth, speaking of this "Gospel" that he now brings to the excluded, those in prison, the suffering and the poor. But for the meaning of the word "Evangelium" in the New Testament, in addition to this - the Deutero Isaiah, which opens the door - also important is the use of the word made by the Roman Empire, beginning with the Emperor Augustus. Here the term "Evangelium" means a word, a message that comes from the Emperor. The message, then, of the Emperor - as such - bears good: it is the renewal of the world, it is salvation. It is an imperial message and as such a message of strength and power; it is a message of salvation, renewal and health. The New Testament accepts this situation. St. Luke explicitly compares the Emperor Augustus with the Child born in Bethlehem: "Evangelium" - he says - yes, it is the Emperor’s word, the true Emperor of the world. The true Emperor of the world has made himself heard, he speaks to us. And this fact, in itself, is redemption, because the great suffering of man - then as now - is this: behind the silence of the universe, behind the clouds of history, is God there or not? And, if this God is there, does he know us, does he have anything to do with us? Is this God good, and does the reality of good have any power in the world or not? This question is as relevant today as it was then. Many people wonder: is God just a hypothesis or not? It he a reality or not? Why do we not hear him? "Gospel" means: God has broken his silence, God has spoken, God exists. This fact in itself is salvation: God knows us, God loves us, he has entered into history. Jesus is His Word, God with us, God showing us that he loves us, that he suffers with us until death and rises again. This is the Gospel. God has spoken, he is no longer the great unknown, but has shown himself and this is salvation. The question for us is: God has spoken, he has really broken the great silence, he has shown himself, but how can we get this reality across to the man of today, so that it becomes salvation? In itself, the fact that he has spoken is salvation, is redemption. But how can man know this? This point seems to me to be a question, but also a demand, a mandate for us: we can find the answer meditating on the Hymn of the Terce "Nunc, Sancte, nobis Spiritus." The first verse says: "Dignàre promptus ingeri nostro refusus, péctori", that is, we pray for the coming of the Holy Spirit, both in us and with us. In other words: we cannot make the Church, we can only announce what he has done. The Church does not begin with our "making", but with the "making" and "speaking " of God. In the same way, the Apostles did not say, after a few meetings: now we want to make a church, and that by means of a constituent assembly they were going to draft a constitution. No, they prayed and in prayer they waited, because they knew that only God himself can create his Church, that God is the first agent: if God does not act, our things are our only ours and are insufficient, and only God can testify that it is he who speaks and has spoken. Pentecost is the condition of the birth of the Church: only because God first acted, the Apostles are able to act with him and his presence, and announce what he does. God has spoken and this "has spoken" is the perfection of faith, but is also always a present: the perfection of God is not only a past, because it is a true past that always carries in itself the present and the future. God has spoken means: "He speaks." And as at that time it was only on God's initiative that the Church could be born, that the Gospel could be known, the fact that God spoke and speaks, in the same way today only God can begin, we can only cooperate, but the beginning must come from God. So it is not a mere formality if we start each day with prayer: this corresponds to reality itself. Only God preceding makes our journey possible, our cooperation, which is always cooperation, and not entirely our own decision. Therefore, it is important to always know that the first word, the true initiative, the true activity comes from God and only by inserting ourselves in to the divine initiative, only by begging this divine initiative, will we too be able to become - with him and in him - evangelizers. God is always the beginning, and always it is only he who can make Pentecost, who can create the Church, who can show the reality of his being with us. But, on the other hand, however, this God, who is always the beginning, also wants to involve our activity, so that the activities are theandric, so to speak, made by God, but with our involvement and implying our being, all our activity. So when we are carrying out the new evangelization it is always cooperation with God, it is in the togetherness with God, it is based on prayer and his real presence. Now, this acting of ours, following the initiative of God, can be found described in the second verse of this hymn: "Os, lingua, mens, sensus, vigor, confessionem personent, flammescat igne caritas, accendat ardor proximos." Here we have, in two lines, two determiner nouns: "confessio" in the first lines, and "caritas" in the second two. "Confessio" and "caritas," like the two ways in which God involves us, make us act with him, in him and for humanity, for his creation: "confessio" and "caritas." And the verbs are added: in the first case "personent" and in the second "caritas" interpreted with the word fire, ardor, to ignite, flame. We see the first "confessionem personent". Faith has a content: God communicates himself, but this “I” of God really reveals itself in the figure of Jesus and is interpreted in the "confession" that speaks to us of his virginal conception at the Nativity, the Passion, the Cross, the Resurrection. This revealing himself of God is entirely a Person: Jesus as the Word, with a very real content that is expressed in the "confessio". So, the first point is that we must enter into this "confession", allow ourselves to be penetrated, so that "personent" - as the hymn says - in us and through us. Here it is also important to observe a small philological reality: "confessio" in pre-Christian Latin would not have been "confessio" but "professio" (profiteri): this is the positive presentation of a reality. Instead, the word "confessio" refers to the situation in a court, in a trial where someone opens his mind and confesses. In other words, this word "confession", which in Christian Latin replaced the word "professio" brings with it the martyrological element, the element of testifying to faith in front of the enemy, testifying even in situations of passion and danger of death. The Christian confession essentially involves a willingness to suffer: this seems to me to be very important. Again in the essence of the "confessio" of our Creed, an openness to passion, suffering, indeed, giving up life is implied. And this guarantees credibility: the "confessio" is not just something that can be abandoned; the "confessio" implies the willingness to give up my life, to accept the passion. This is also truly the verification of the "confessio". It can be seen that for us "confessio" is not a word, it is more than pain, it is more than death. For the "confessio" it is really worth suffering, it is worth suffering up to death. Whoever makes this "confessio" shows in this way that what he confesses is more than life: it is life itself, the treasure, the precious and infinite pearl. And it is in the martyrological aspect of the word "confessio" that the truth appears: it verifies itself only for a reality for which it is worth suffering, which is stronger than even death, and it demonstrates that I hold the truth in my hand, that I am more than certain that I am "bearing" my life because I find life in this confession.Now let's look at where this "confession" should penetrate, "Os, lingua, mens, sensus, vigor". From St. Paul, Letter to the Romans 10, we know that the location of the "confession" is in the heart and mouth: it has to be deep in the heart, but must also be public; the faith carried in the heart has to be announced; it is never only a reality of the heart, but tends to be communicated, to really be confessed before the eyes of the world. So we have to learn, on the one hand, to be truly let's say penetrated in the heart by the "confession", so our heart is formed, and from the heart also find, along with the great history of the Church, the word and the courage of the word, and the word which indicates our present, this "confession" which is always however one. "Mens": the "confession" is not only something of the heart and mouth, but also of the intelligence; it has to be thought about and thus, thought of and intelligently conceived, it touches the other person and always assumes that my thought is truly located in the "confession". "Sensus": it is not something purely abstract and intellectual, the "confessio" must also penetrate the meanings of our lives. St. Bernard of Clairvaux told us that God, in his revelation, in the history of salvation, gave our senses the possibility to see, to touch, to taste revelation. God is no longer only a spiritual thing: he entered the world of the senses and our senses have to be filled with this taste, with this beauty of God's Word, which is true. "Vigor": is the vital force of our being and also the juridical vigor of a reality. With all our vitality and strength, we must be penetrated by the "confessio", which has to really "personare"; the melody of God must sing our being in its entirety. "Confessio" is the first column so to speak of evangelization and the second is "caritas". The "confessio" is not an abstract thing, it is "caritas", it is love. Only in this way is it really the reflection of divine truth, which as truth is also inseparably love. The text describes, in very powerful words, this love: it is ardor, it is flame, it ignites others. There is a passion of ours that has to grow from faith, that has to be transformed into the fire of charity. Jesus told us: I have come to bring fire to the earth, and how I wish it were blazing already. Origen handed down to us a word of the Lord: "Whoever is close to me is close to fire". The Christian must not be lukewarm. Revelations tells us that this is the greatest danger for a Christian: not that he says no, but a very tepid yes. This tepidness really discredits Christianity. Faith must become in us the flame of love, flame that really ignites my being, becomes the great passion of my being, and so ignites my neighbor. This is the way of evangelization: "Accéndat ardor proximos", so that truth becomes charity in me and charity like fire ignites my neighbor. Only in this igniting of the other through the flame of our charity does evangelization really grow, the presence of the Gospel, which is no longer just words, but a lived reality. St. Luke tells us that at Pentecost, at the foundation of the Church of God, the Holy Spirit was fire that transformed the world, but fire in the form of tongues, that is, a fire which is however also reasonable, which is spirit, which is also understanding; fire which is united to thought, to "mens". And it is truly this intelligent fire, this "sobria ebrietas", that is characteristic of Christianity. We know that fire lies at the beginning of human culture; fire is light, heat, the power to transform. Human culture begins when man gains the power to create fire: with fire he can destroy, but with the fire he can transform and renew. The fire of God is transforming fire, the fire of passion certainly that also destroys much in us, that leads to God, but fire, above all, that transforms, renews and creates a new man, who becomes light in God. Thus, in the end, we can only pray to the Lord that the "confessio" be founded in us deeply and become the fire that ignites others; thus the fire of his presence, the novelty of his being with us, might become really visible and the strength of the present and future. "The Church Exists to Evangelize"
From the President's Desk: "I Am Concerned"
In San Francisco, "Rebuild My House"
On DC's Red Sunday, A Call "To Look For the Good"